Health professionals joined a rally outside the State House to save the federal health law. 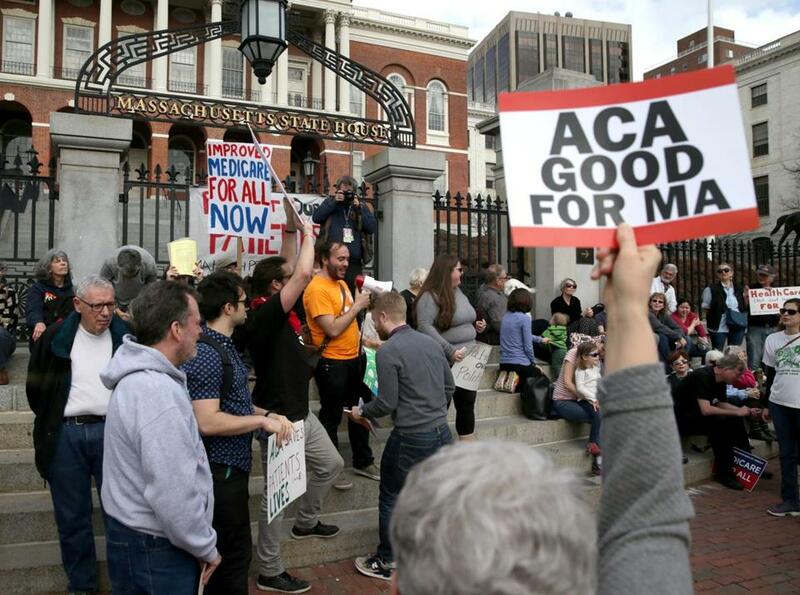 A crowd of doctors, health care executives, and other supporters of the Affordable Care Act gathered in front of the State House on Saturday to condemn President Trump’s vow to dismantle the nation’s landmark health care law. Some protesters wore white doctor’s coats, and others held signs reading, “Patients Over Politics,” and “Hands off our ACA. People die when they cannot pay.” The hourlong rally was one of about 50 such actions held across the country Saturday by health care advocates. Gottlieb was one of several speakers who voiced their opposition to repealing the law, which has provided health insurance to an estimated 20 million Americans. “This is the most important piece of social justice and civil rights legislation since the Great Society,” Gottlieb said, referring to domestic programs rolled out in the 1960s under President Lyndon Johnson. “Health care is absolutely a right and not a privilege,” he added. Trump and Republican leaders in Congress have said they will repeal the Affordable Care Act, the signature of achievement of President Barack Obama. It is not yet clear what a replacement law would include, however. Donna Kelly-Williams, president of the Massachusetts Nurses Association, told the vocal crowd that the union will oppose any bill that limits patient access to health care. Jon Santiago, an Army Reserve captain and emergency room doctor at Boston Medical Center, said many of the patients he treats live in poverty. Access to affordable health care is essential for their well-being, he said. “Our friends and our families, when they’re downtrodden by society’s ills, they so often end up in the emergency room,” Santiago said. Christopher Lorant, 52, of Framingham, said repealing the federal law would jeopardize his coverage under MassHealth, the state’s health insurance program for low-income residents. Lorant, who walks with a cane, said he can’t afford his prescriptions without MassHealth, which largely depends on federal funding provided by the Affordable Care Act. “The fight for good health care will be an ongoing battle for a long time to come,” said Lorant, who began receiving disability befits two years ago after knee injury forced him to quit his retail job. At the end of the impassioned speeches, dozens of people lay on the brick sidewalk to stage a “die-in,” to highlight Americans who have died because of insufficient health care. “Get ready for a fight, Health care is a human right,” they shouted in rounds. Each round grew louder than the last.